If you are looking for information on the Tasti D-Lite franchise business opportunity, Tasti DLite franchises or Tasti D Lite franchising , then you have come to the right place. The right opportunity. At the right time. Now more than ever, people need a little Tasti D-Lite... check out this fast-growing good-for you frozen dessert concept. Simple and fun to operate, Tasti D-Lite features a product that's been the talk of New York for more than 20 years. Unlike other light concepts, it's lower in calories, fat and carbs and has a rich texture and creamy delicious taste. So healthy, it becomes a daily habit! On the busy streets of New York, where you can find any cuisine in the world, Tasti D-Lite is the "guilt-free" daily indulgence of loyal celebrities, A-listers, supermodels, and any New Yorker in the know. And now this New York phenomenon is taking healthy eating worldwide via single franchises, multi-unit opportunities, area developers, and international master franchises. 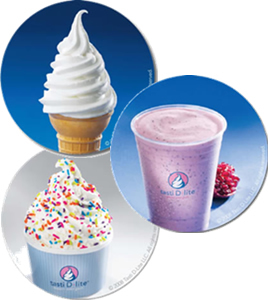 Tasti D-Lite is the world's leading provider of great-tasting, good-for-you frozen desserts. Our signature product is a soft-serve, dairy-based frozen dessert with an indulgent, creamy delicious taste. It's significantly lower in calories, fat, carbohydrates and sugar than traditional ice cream products. Yet the taste is rich and satisfying. This is a new kind of product, created through science that harnesses nature's own technologies. Tasti D-Lite is not a "fad" concept. Our products are based on 20 years of experience, consumer testing, and street cred. Unlike other concepts, we offer healthy eaters a lot of healthy choices. 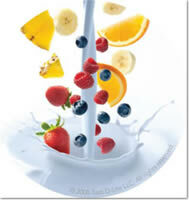 Classic Tasti comes in more than 100 fabulous flavors, and we also make healthy shakes, sundaes, smoothies, and cakes. More healthy options - like added probiotics - and new products are still to come. It's easy for Tasti D-Lite to become a daily delight - for any day part. Tasti Is On Track To Grow Fast. Tasti D-Lite is uniquely positioned to become an essential part of everybody's life. Because healthy eating isn't just a trend. It's taking off. Overall spending on reduced fat, carb, and calorie products is up $9 billion in the past 4 years (QSR One Source, "How America Eats," Nov. 2007). Consumers of all ages expect food to fulfill their dietary requirements while satisfying their appetites. They're steadily shifting from traditional or premium frozen desserts to lighter options. Do Something Good. And Do It Well. For a food business, a Tasti D-Lite center is simple to start up and operate. And we make it easy and fun. We're committed to training and supporting you to earn your success. This Is Your Opportunity To Be One Of The First. You could be the first to bring this New York phenomenon to your area, and start a healthy eating trend in your own community. We're now offering single franchises and multi-unit franchises in many U.S. states and territories. If you seek to grow beyond a single location, our simple business model scales beautifully. are available, too. Just ask.